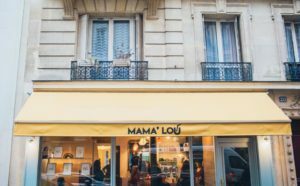 Mama’lou is a new 100% family-friendly 15th arrondissement place. It is settled to be a rest place for parents with kids, for them to chat, enjoy a piece of cakes and coffee or work while kids are playing in the play area, practicing in a workshop or during a birthday party. For kids: a nice play wooden hut full of toys; and of course all the baby and kids facilities such as high chairs, changing facilities, kid toilet. For adults: coffee, tea, cakes, snacks … and relaxing time! Mama’lou organizes workshops for kids and adults in French and English. 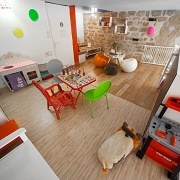 Find here more family-friendly addresses in Paris 10th. Among the family-friendly cafes, Poule Mouillette welcomes you near Canal St Martin. A shop selling children and family products from new designers, a tea room and workshops, this café will be a pleasant after a walk along Canal St Martin or a play in Villemin public garden (facing the cafe). You’ll find there high chair and bouncer, play area for your little one, wifi and (French) newspapers, children toilets and changing station… and – most important – cakes and drinks. Your children can participate to workshops (currently only in French) sur as music, singing, yoga, story time, creative workshops…lot of choice in the agenda (advance booking is mandatory). Ma poussette à Paris wrote a review here (in French). Children workshops in French only. A great address we found out recently in the 15th arrondissement: it is together a family-friendly tea-room, a second-hand shop and workshops place offering plenty of activities: baby carrying, baby-gym, baby-music, knitting, cooking,…there are workshops for everyone, for children from 2 and for adults. Some workshops are suitable for parents and children with limited French. 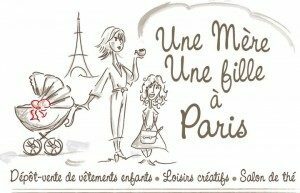 Of course the place is 100% child-friendly with play-room, child-toilet, changing mat… Enter Une mère une fille à Paris you’ll be welcome like at home.